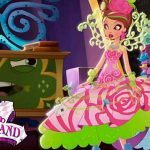 It’s been a long time since the last Ever After High card was post, but now we have a new one! 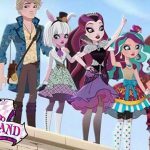 A new ever after high student is officially presented. 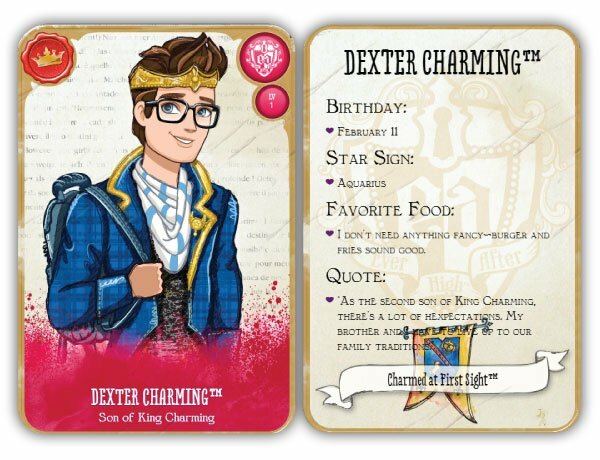 He is Dexter Charming and is the son of the King Charming. His big brother is called Daring Charming. Dexter is shy but friendly. Although charm seems to be a family tradition, he always trips over his words when he tries to charm girls because he is quite shy. Unlike his brother he isn’t very charismatic. Dexter has fallen in love with Raven Queen but he has troubles expressing his love to Raven so she is unaware of it. Who has a crush on Dexter is C.A. Cupid, however, Dexter seems to be unaware or not interested. He has blue eyes and wears glasses and her hair is brown and wears a gold crown. His basic outfit is a blue plaid blazer with gold endings and a blue and white scarf. Under it, he wears a black sweater and grey jeans. Dexter’s pet is a jackalope, which is a rabbit with antlers. Parent’s Story: Every fairytale where a Prince Charming comes to the rescue. His Secret Heart’s Desire: He doesn’t wants to be just anyone’s Prince Charming. She should be her true love. That’s his idea of Happily Ever After. His “Magic” Touch: For some reason girls swoon when he takes off her glasses. His Storybook Romance Status: He’s trying to summom the courage to aks out Raven Queen. His “Oh Courses!” Moment: He has a hard time seeing without her glasses. He’s been told they block his “enchanting eyes”, whatever that means. His Favourite Subject: Hero Training. He may not be the king of the class, but he loves a good challenge. His Least Favourite Subject: Advanced Wooing. Unlike his brother, he always trip over his words when he tries to charm girls. His Best Friends Forever After: Her brother Daring Charming and his roommate Hunter Huntsman. I hope he becomes a doll soon!!! I feel bad for him. Because his brother Daring gets all the girls. I mean what’s the BIg deal with Daring. I actually think Dexter is nice, embaressed, cute glasses. He is so cute!But,I think he should be with Ashlynn Ella instead of Raven Queen. I love Dexter he is so dreamy!! especially the glasses! what is the big deal with daring? Dexter is my dream guy! I love him I love him I love him so much! well I think that his personality and Ashlynn’s personality are quite similar and well I believe that Ash and Dex are the younger siblings of Daring. so they couldn’t be together as a couple. I think everyone encluding apple white should shutup and right their own destiny. I think that he is cool! I feel a little bad for him. He should get the girls instead of Daring. he is so cool. The only reason why is because he has my birthday! No way look maybe raven queen likes him a little but still if that is not raven queens true love then nobody needs to force her to. Dexter is my storybook crush so dreamy! I love Dexter Charming so much because he is geeky and unique and not afraid of doing what he wants, he is so much like me i wish he was real i would totally date him not daring daring is so stuck up and snoby i would never date anyone like him. Just Dexter! dexter is sooooo cute. i wish he was here in the real world. I know right? Love your name by the way!! Raven is a rebel and Dexter is a royal, how can they live happily ever after? Ashlyn and Hunter are the same. Dexter is sooooooooooo dreamy!!!!!! He is SOOOOOOO CUTE!!!!!!!!!! I wish he was real!!!!!!!!!!! Dexter is way cuter than all the other boys, including Daring. I love dexter. He is like the number 1 coolest guy in EAH. I have the dexter doll and I think he is cuter then daring I can’t believe that holly o hair likes daring ? He is genius and he is kinda a nerd but he is cute than hes brother Daring Charming.